Disney has taken on most of the famous European/American fairy tales that most children know - though do they know them from being told, or seeing the Disney movie we'll never know. From The Little Mermaid, Beauty and the Beast, Peter Pan, Snow White and the Seven Dwarves, Cinderella, Sleeping Beauty, etc. they've covered the genre quite well. Thankfully, they are actually timeless stories that can be retold and actually stand up to the retelling (though not all the time). 5. Ever After - A retelling of the "true" story of Cinderella, the young woman raised by an evil stepmother with terrible stepsisters. 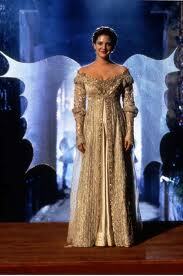 In Ever After, Danielle (Drew Barrymore), is the servent in her own home. She is well read, and eventually meets the Prince (Dougray Scott). She fights with him about changes he can make with his power -opening libraries, helping the poor, sponsoring artists (DaVinci), etc. It's kind of a feminist re-telling of Cinderella, but I like it every time. 4. 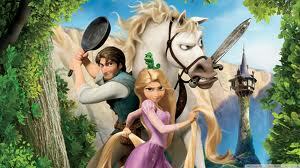 Tangled - This is probably the best recent Disney animated fairy tale. It returns to the great musicals they produced when I was a kid. The over-the-top nature of Rapunzel's hair allows for an extremely tall tower. And the change they make that her hair is magic - giving eternal youth, and that's why it can never be cut and why she was kidnapped by a witch. Yes, she is rescued by a guy, hardly a Prince, but she knocks him out too. They're kind of equals except that he has street smarts that help get her what she wants. Zachary Levi as Flynn Rider - con man - cracks me up. 3. 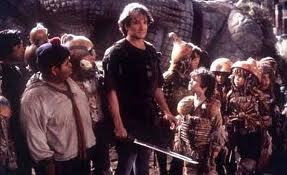 Hook - Seriously, if you were a child during any part of the 1990s, this movie is magic. We're willing to admit it's also pretty terrible, but I would have done anything to play in the treehouse they built for the lost boys. The kid, Jack (Charlie Kosmo), is insanely annoying to watch today, but back then he was pretty great. The colors, the hope, etc. make this movie a joy. 2. 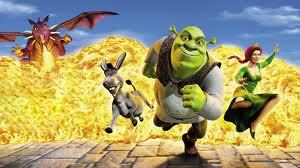 Shrek - The first of the recent movies attempting to make-over the fairy tale. Shrek is an ogre who becomes the hero. It's a fairly ham-fisted attempt to tell a new story, but I think that's because it was so cleverly crafted that we've just accepted that it always was a fairy tale that needed to be mixed together an retold. Unfortunately, the overuse of the characters have given a poor taste to the franchise, but the original is still pretty magical. 1. 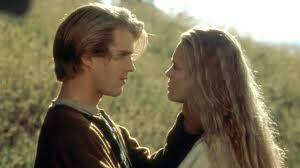 The Princess Bride - Fencing, fighting, torture, revenge, giants, mosters, chases, escapes, true love, miracles... need I say more?